Over the years, I have worked with many organizations whose previous strategic plans were flat documents that didn’t embolden them, ignite their imaginations, or inform their daily decision-making. One of the reasons was that they were applying a 20th century model to 21st century problems. They invested a great deal of energy in word-smith-ing a mission statement, a vision statement, a long list of values, and then goals, objectives and action steps. This approach of breaking everything into smaller and smaller units (remember learning: kingdom, phylum, class, order, family, genus, species?) preceded the Industrial Age, was perfected during it, and continues to be ubiquitously used by even the most cutting edge organizations when they plan. A more dynamic approach that creates amazing results engages participants and stakeholders in conversations about what makes them unique, factors that may influence their future, and the most valuable services or products they can produce. They identify strategic issues their organization needs to address in order to reach its fullest potential. At this point, traditional planning would water down this rich, steamy soup into pages and pages of goals and objectives which would lie lifeless on the page until the next strategic planning effort. Instead, the process I’ve found so successful draws on an experience most people have had as youth—that of earning badges as a scout, 4-H’er, a campaign worker, or through other club or team activities. Organizational leaders are challenged to design 3 Strategic Initiatives, or “badges” that address as many of the strategic issues their organization faces as possible. Rather than their plan resulting in a laundry list of goals and objectives that nobody can remember, implement, or track, participants create a bit of magic by synthesizing all of the factors they’ve been exploring into just a few “badges” or initiatives, each of which they give a name. They easily identify the criteria needed to “earn” each badge, ways the badges fit together, and who will do what by when in order for the badges to be earned. If you’ve ever worked on any kind of campaign, you remember the sense of urgency and clarity about the goal (to “win”) that this approach generates. Although I’ve witnessed it now many times, it’s still breathtaking to watch leaders shift out of old modes of thinking and approach their shared future with clarity about the results they want to achieve and the steps they will follow to achieve them. They blossom creatively and find renewed commitment to the organization, connecting with one another in unprecedented ways. They have a high degree of ownership of and enthusiasm for their “badges.” An added bonus is that when leaders communicate these initiatives to members, they find members ready to pitch in and join the fun. The next time you face a challenge either personally or organizationally that requires a plan to achieve it, try this variation and experience for yourself the power of breaking out of the familiar, lackluster mode. You’ll be amazed at how eagerly and naturally people work together to achieve badges they’ve identified and committed to earn together. A friend’s analysis of relationships is that every relationship needs a gardener. According to him, two gardeners can make it; a gardener and a flower can make it; but two flowers will never make it. Gardeners can't help themselves--it is their nature to try to improve whatever is within their influence to do so. His analysis came to mind this morning while I was walking my dog past the beautiful gardens of neighbors Val and Dottie Hawkins. 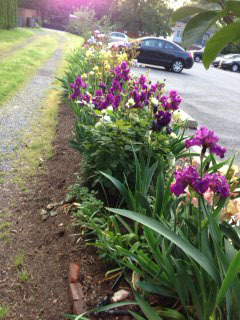 They have not only beautified their corner of Old Town, they have created and tended breathtaking borders of iris, roses, and peonies along an adjacent parking lot, shown in the photo. Really, now, how many people would do that? And their gardener ethos is visible in the many boards on which they serve in our community, the numerous people they have helped, and the wise leadership and vision they have generously given our city. Just like relationships, organizations need gardeners—people who will till and plant and weed and water until the fruits of their labor materialize. Gardeners are often not the highest profile individuals in their organizations, yet organizations could not thrive without them. Imagine hiring and nurturing people who will find potential to be tapped and do whatever is necessary to bring that potential to bloom. Identify the gardeners in your organization, connect them with one another, encourage them, and see what grows. Strive to be more of a gardener than a flower, looking for ways you can contribute, using untapped resources within and around you. You will find personal satisfaction in knowing you have created something beautiful and useful out of very little, regardless of whether others recognize and praise your accomplishment. Here’s a salute to the unsung heroes of every relationship, organization, and community—gardeners like Dottie and Val whose nature is to give more than they take.